Green and yellow split peas are different varieties of the seeds of the Pisum sativum L., or field pea, plant. Belonging to the legume family, this plant is found throughout the world, with the world's top producers being Russia, China, India, Canada and the United States. Due to the plant's versatility and near universality, split peas are found in the traditional dishes of a variety of cultures around the world. Pisum sativum L. is one of the oldest crops cultivated by human beings. A native of the Fertile Crescent, Pisum sativum L. spread east to China and west through the Mediterranean and across Europe. The gathering of wild, whole peas for use in food may predate the plant's domestication, with peas carbon dated to 9750 B.C.E. found in an ancient settlement in Southeast Asia. Despite its long history in the diets of the ancient Roman, Greek, Babylonian, Persian and Egyptian civilizations, the use of split peas arose thousands of years after the plant's domestication. Evidence of split pea soup dates back to 500 B.C.E. in the Greek and Roman civilizations, with its growing popularity leading to a mention in Aristophenes' play "The Birds" from 414 B.C.E. A mechanical process, splitting the dry seeds of the Pisum sativum L. plant first involves husking, or dehulling, the seeds. This removal of the outer coating of the seed allows for easy division of the pea into its two cotyledons, the parts of the seed that eventually develop into leaves. This removal of the husk and splitting of the pea results in a sweeter, less starchy, earthier taste, softer texture and shorter required cooking time than for whole peas. Barbara Kneen of Cornell University and various others identified the genetics of Pisum sativum L. over a number of studies through the 1980s and 1990s. In a 1994 study, Kneen and her colleagues found that the color of the seeds of Pisum sativum L. is coded for by a specific genetic locus. Due to the specificity of this gene, the color of split peas is not associated with many major differences. Both have similar flavors, nutritional content and cooking time, though yellow split peas tend to have a milder flavor than their slightly sweeter, green counterparts. 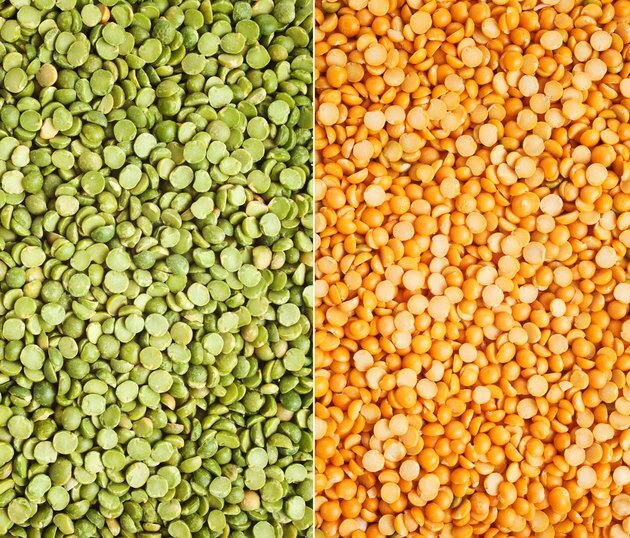 Split peas are highly nutritious, with both yellow and green split peas providing a variety of micro and macronutrients. A one cup serving of cooked split peas contains 231 calories, with almost no fat content at 0.8 grams. Split peas are very high in protein, with one serving containing 16.4 grams. Though relatively high in carbohydrates at 40 grams per serving, 16.3 grams of this is dietary fiber with only 5.7 grams of sugar. Aside from their high protein and fiber content, split peas are a great source of a number of other nutrients. One cup of split peas provides 196 percent of your recommended daily intake of molybdenum, 56.3 percent of your RDI of tryptophan, 39 percent of your manganese, 31.8 percent of your RDI of folate, 24.7 percent of your thiamine, 20.3 percent of your potassium and 19.4 percent of your RDI of phosphorous. In addition to these high micronutrient values, one serving of split peas is an excellent source of 11 amino acids and provides between 10 and 20 percent of your RDI of magnesium, iron, zinc and copper.